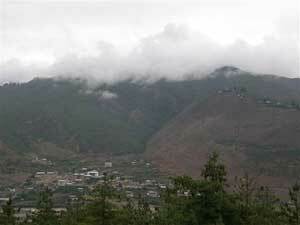 There was a time, not that long ago, when tourists knew nothing about the small landlocked tiny kingdom of Bhutan located between India’s craggy Himalaya Mountains and China and bordering on Nepal. 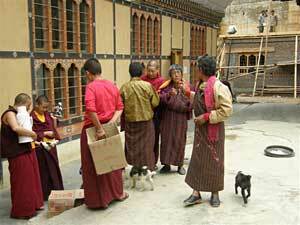 And the Bhutanese knew nothing about the outside world. 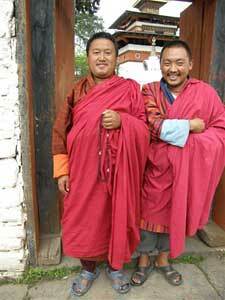 In this ‘last place on the roof of the world”, is a country with approximately 700,000 people who have deep respect for elders and monarchy, their lives revolving around Tantric Manayana Buddhism. Dzongs (fortress-like monasteries) dot the pristine countryside and are perched precariously on hilltops. Until the 1970s few foreigners were even aware of the “Land of The Thunder Dragon”. Not a TV or computer could have been found then. 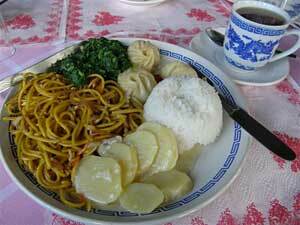 However, these days there are a few cyber cafes and a plethora of television dishes seen throughout this tiny country. Although the Bhutanese adore and cherish their absolute monarchy, it was only in 1972 that Jigme Singye Wangchuck, ascended the golden throne and slightly opened the doors to the outside world. Now, the fifth monarch, Oxford educated Jigme Khesar Namgyal Wangchuck who became king in 2006, is uncompromising about the ancient traditions and cultural values, but remarkably, has initiated a Parliamentary democracy and voting system taking place in 2008 for the first time ever. He too, is obviously interested in a more open-door policy for tourism. This may be a rude awakening for the 90% of hill farmers and inhabitants of the serene sequestered regions. The reality is that this poor agricultural country could become a cash-cow from tourism. 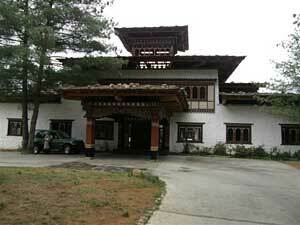 There has always been the philosophy that they don’t have a ‘Gross National Product but ‘Gross National Happiness’. 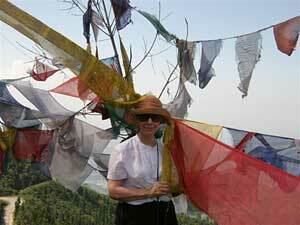 “Happiness is our wealth,” my guide Yeshey Samdrup, told me at our first meeting. He was my able, intelligent, gentle guide for the next 5 days. 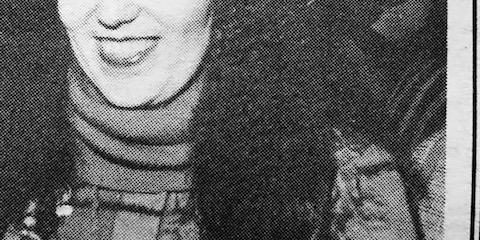 Yeshey was always punctual, often passive but always polite and helpful. 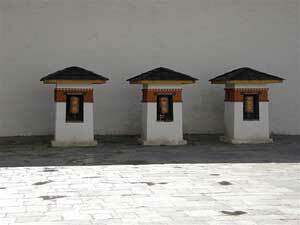 With only 18,000 visitors permitted to visit last year, I felt privileged and seemed a curiosity in the two cities, Thimphu and Paro, which I visited. Shy and modest, these kind people, still in a time warp, are quickly becoming acquainted with the new technology and Westerners. Dressed in the mandatory ‘gho’ and ‘tego’ for men ( a long pulled up robe-like one piece coat/dress tied with a belt and a white under blouse which forms wide cuffs, worn just below the knees which meet the knee high stockings),women wear the mandatory ‘Kira’,( a simple jacket and long wrapped skirt.). The only variation is arbitrary colour. My journey started in Darjeeling, India where the 5 hour and only 176 km trip, was probably one of the most uncomfortable I’ve ever taken. The unpaved roads, with hairpin twists and turns along the Himalayan Mountains, not only caused me some concern but also acute nausea. That said, as we drove along the so-called highway it was great insight into the attempt to improve conditions. There were hundreds of migrant Indian workers, men and women, (some with babies wrapped on their back), hacking away at the rocky mountains, piling boulders on the sides of the road, making it even narrower and more difficult to navigate but creating a more tourist friendly country and assistance to abject Indian poverty. 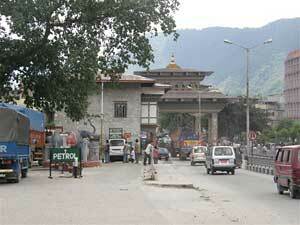 Much of the highway is being financed by Bhutan’s friendly neighbour, India. What amazed me was that there was no road rage. Instead, a honk suggested to the car’s driver in front to move over to the treacherous limited shoulder. There was also this amazing happening when on coming cars would either move to the constricted side space without careening down the into the valley or hitting a cliff. I never got an answer about who has the right of way. The amazing news is that I didn’t witness any head-on collisions. Although it’s expected that this very long single lane quasi highway will be doubled in size by 2010, I certainly have my doubts for this is a daunting undertaking. However, arriving at the Druk Hotel at the border city of Phuentsholing, I soon realized the disparity between the two countries. The long main street is divided by a brick arch and wooden barrier, the border of the two countries. The Indian customs house where a visitor’s visa must be stamped, is a dreary, dusty single room. But just a few metres away, I realized how important cultures are and found amusement in the fact that just beyond the messy, garbage hills of the final stop from India before entering Bhutan, miraculously, on just the other side of the barricade, were sparkling clean streets of Bhutan. Same street, different sensibilities. Although there’s little to praise about the dreary Druk Hotel other than a place to overnight,(I was told renovations will start soon), the traditional and intricate carving and paintings on the façade were pure and intricate with ethnic details- an introduction to the important and beautiful architectural aspect that I was to see throughout the country. 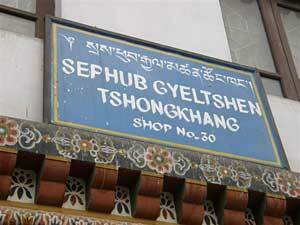 Phuentsholing has two streets where there are a shops filled mainly with Indian goods, a smallish, green park with an elaborate, busy temple and a group of joyful, playful youngsters kicking a ball. Probably later on in life, they would become infatuated with the national sport, archery, not soccer. Early the next morning, the nine hour drive to the capital city Thimphu (179 km) with a population of 80,000, was again on awful roads. We were late by just minutes at the twice daily road closures where for an 1 ½ hours Yeshey and I walked spent time at a temporary market and truck stop with vendors who were smart enough to set up short-term stands selling drinks and fruits. The new open-door policy for travellers seems to have made entrepreneurs quickly. 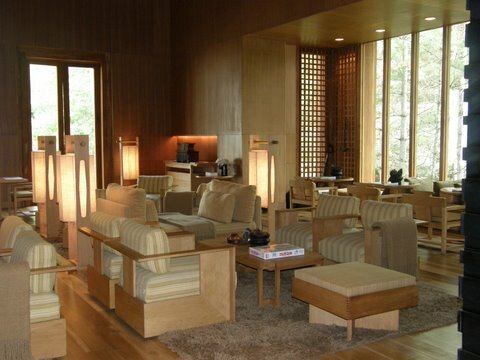 This white washed plaster, dark teak and ‘champ’ wood (indigenous to Bhutan) detailing that looks so very modern although not out of place since the architects had incorporated stone and also traditional Bukari stoves in all the rooms. This sleek, 16 room hotel set in a blue pine forest, is the antithesis of the traditional buildings, however, the slight narrowing at the top and the covered open-sided walk way make it very temple like.It may not seem the trip of a lifetime but soon with all the angst and sturm of the highway challenges now gone, we arrived at Thimphu, the world smallest capital city and the only capital city without a single traffic light. Dusk was settling in on this glorious mountainous aerie. Driving through the main street, there are facades with even more elaborate carving and painting on cornices and window frames, even on gas stations and police boxes, and not a high-rise in sight. However, my explorations would have to wait until the next day as we headed to the unexpected stunning Amankora Hotel, a deluxe 5 star hotel, near Kuenga Chhoeling Palace. With a world class spa and restaurant, this retreat decorated in neutral tones of taupe, ecru and brown, with indirect, dim lighting, creates a very calm and serene oasis. Large rooms all were designed and flowed without a divider into an area with oversized tub, separate showers and double sink vanity (the loo is in a separate space). It may not give some the needed privacy but being on my own, I found this an extraordinary space. 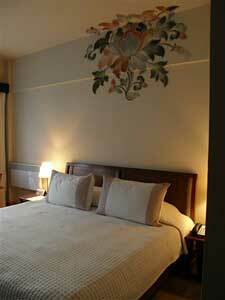 It’s small wonder that this hotel chain (they have four in Bhutan plus others around the world) tops of the list of 5 star hotels. During the night I thought I was dreaming as I heard the barking of hundreds of dogs, the same stray packs that I would see sleeping in masses during the midday heat. Next morning, bright and early, Yeshey had a full day’s itinerary planned. Walking is the only way to see this small city and being a weekend, our first stop was to the Weekend Market where the vegetable area was crowded with locals and the handicrafts section was filled with tourists. 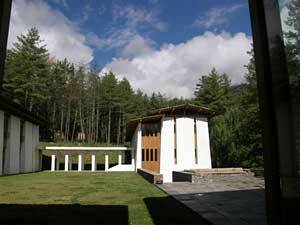 Punakha Dzong, a 17th century fortress considered one of the most beautiful Dzongs in Bhutan was our next stop. The air is thin since this country is over 7000 feet above sea level. Often, I stopped to catch my breath. 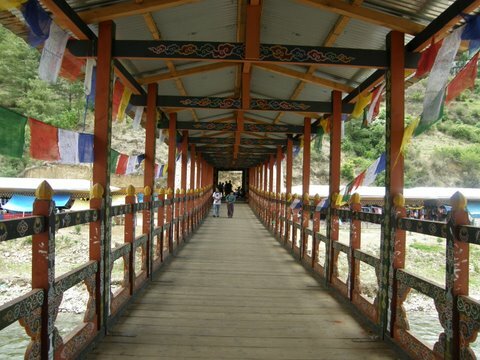 Thimphu is a hiker’s paradise and two young Australians staying at the hotel, had spent 3 hours walking to Phajoding Monastery. Each purchased a ‘gho’ which they wore to dinner and looked very smart. Certainly not a long hike, Yeshey and I traipsed up a narrow incline to National Animal enclosure to see the very strange and unique –to-Bhutan, Takins, which still befuddle taxonomist and are in a category of their own. By the time we reached the area, I was panting although the terrain wasn’t overly hilly. Being Sunday, The Textile Museum was closed but the textile and fashion school was open and it’s where I was shown designs by local designers. Not surprisingly, the styles were somewhat redundant but the fabrication, using a lot of yak wool and bright colours, were a valiant attempt away from their uniforms. On the premises were students learning to sculpt wood and paint on the handmade paper that comes from a small factory nearby. Their determination seemed like a triumph of patience. Simtokha Dzong, the gateway to the Thimphu Valley and the location of the Institute for Language & Culture, is decorated with extremely ornate frescoes while Tashichho Dzong, built in 1641 and rebuilt in 1902 after a fire and earthquake, is the religious centre of the country and also has a Throne Room for the King and where the monks were happy to pose for pictures. After a fine dinner of very spicy prawn soup, stir fried beef with oyster sauce, steamed jasmine rice, yellow pork curry, I slept much like those dozing dogs. 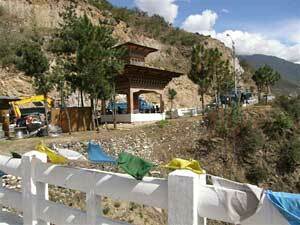 Paro, 65 km, 2 hours away, is the second largest city but with the only international airport. The drive was perfect for seeing deserted houses and patchwork-like paddy fields and the rushing Paro River. Here I stayed at the Uma Hotel, part of the COMO Group, another unexpected 5 star chain. 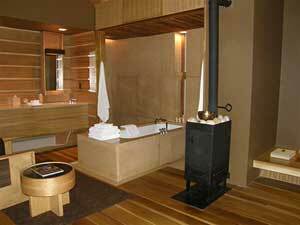 Built by traditionally trained Bhutanese artisans, there are many modern conveniences. 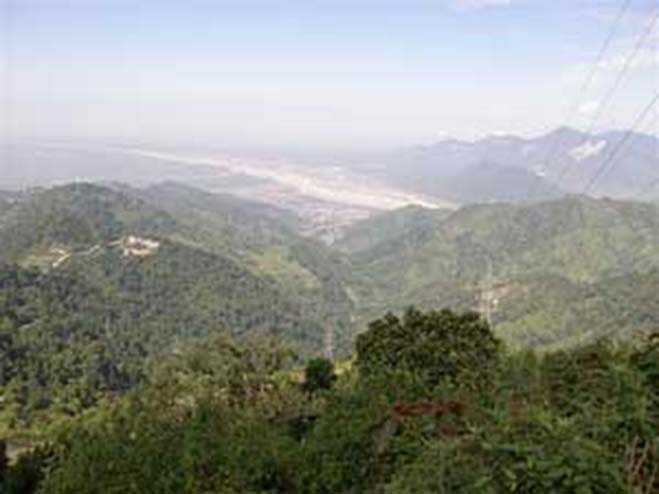 The unique setting offers views of the mist and clouds clinging to the tops of the Himalayas. 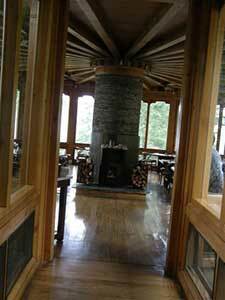 The circular wood paneled restaurant is completely windowed with vistas I wouldn’t have wanted to miss. 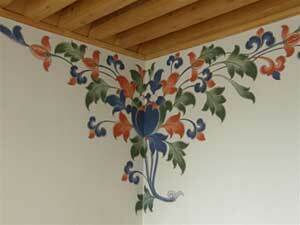 And the rooms have incorporated finely hand painted frescoes above the beds. Although there is an Asian inspired spa, with my time limited, I opted for an energetic hour long yoga class held at the end of the day. Aussies like to travel and Isabel from ‘down under’, held a daily very energetic class in the large gym, again featuring floor to ceiling windows with views of the mountains. I can’t tell of the joy at the large library with two working computers with internet access. Obviously, not all my serenity had been claimed by this enchanting environment. 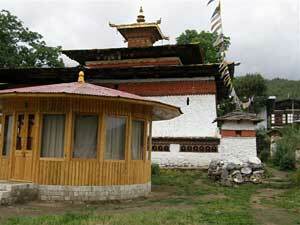 Although not the capital city, Paro is where the National Museum (Ta-Dzong) is located- this unique building, originally Paro’s watchtower. The 340 year old round, 7 storey building has more than 3000 artifacts and covers more than 1500 years of culture. 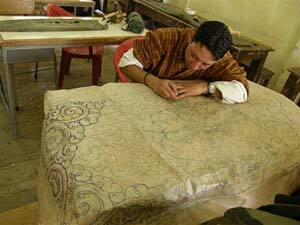 Dzong paintings, Thangka art from 12 AD, bronze paintings, arms and armour, jewelry and textiles and in important ancient water clock are memorable. The narrow steps seemed perfect for the Bhutanese, but my somewhat larger size feet caused me to hesitate as we climbed the steps here and all over the cityscape. 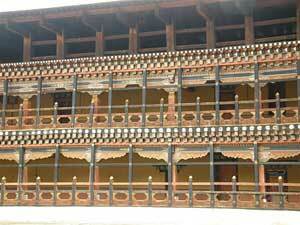 Paro Dzong is one of the finest examples of Bhutanese architecture and the seat of local government. 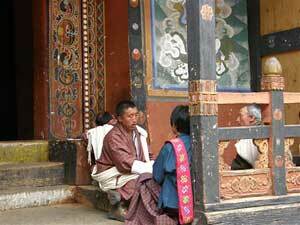 And Kyichu and Jambay Lhakhang are the oldest temples in Bhutan dating back to the 7th century and of great religious and cultural important. Of course, there are many more sights to see but with my 5 day visa restriction, I had to leave early the next morning from Paro to Mumbai where I had a recovering period at the famous Taj Mumbai Hotel facing the Gateway to India. I couldn’t resist walking among the hoards of Indians getting their hands hennaed, eating the local and delicious ice cream and watching sales pitches of most unusual objects like pear shaped five foot balloons. I had to wonder what a purchaser could possibly put this enormous blow ups. 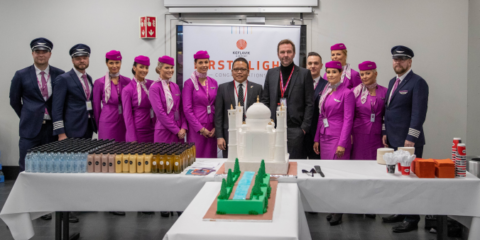 Finally exhausted, I was delighted to spend the next double digit hours being catered to on Etihad Airways on my flight via Abu Dhabi, in the United Arab Emirates, another country that is vying for tourists. But few memories could ever compare with the fluttering in the wind of the five colours of Prayer Flags seen throughout this precious country. These thin printed banners carry messages to the heavens in the clouded and misty clad mountains. 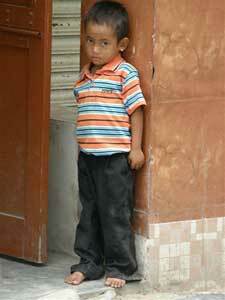 Hopefully my prayers will be answered and I’ll return to both countries to see what I may have missed.